Jym is one of my favorite ‘fitfluencers’ because not only is he incredibly knowledgable, but he is also very very accessible. He maintains a very up to date and informative blog. He consistently posts youtube videos, instagram posts, and bits of knowledge on other social media channels. He has a weekly podcast. Heck he even does google hangouts and answers ad-hoc questions from the masses! I really don’t know if Jym Stoppani sleeps. He definitely doesn’t. But neither do I. Lol. But seriously I have become a true fan of this guy because on top of everything, he has without a doubt helped me achieve some of my own personal goals. His ‘Shred Jym’ program (on bodybuilding.com) has actually worked wonders for my physique- and I’ve only been doing it for like two weeks! I’m going to do my first ever ‘workout program’ review on this program to give you a better understanding of how good it is. Speaking of workout program reviews- look for this to become a more significant part of the BPW. I’m excited to start sharing some of my own workout experiences with you all! But let’s get back on track with Shred Jym. We might as well start with the most important aspect of Shred Jym- does Shred Jym work? It should really come as no surprise that someone as smart as Jym Stoppani creates some of the most effective and well though-out formulations on the market today. His Pre-Jym pre workout is still my absolute ‘go-to’ when I’m in the weight-room and need something to get me going. The sparknotes of my Pre-Jym review are basically that it tastes amazing and makes you strong as an ox. Enough said. But with Shred Jym- I really was looking for a different effect. As you know I’m coming towards the end of my Summer ‘cut’ phase when I really try and tone and define my physique. After taking Shred Jym for a few weeks, I can safely say that this fat burner does quite a nice job of both. I think that alot of the effects that I got from Shred Jym can be attributed to the intense six weeks to cut program that Jym has me on, but I totally think that the Shred Jym pills have accelerated the changes that I’ve been seeing. So what are these changes? What benefits has Shred Jym brought to my body? Well first of all, I think that OVERALL my body is just sort of ‘drier’ looking. Some of these products have certain ingredients that pull alot of water out of the body. That doesn’t seem to be the case looking at the supplement facts of Shred Jym- but then again I don’t pretend to know absolutely everything about the functions of these ingredients! But getting back to what I’ve personally seen in the mirror- my abs just have better overall muscle quality and definition. There’s like, less ‘loose’ skin just flying around over the top of everything. (you know what I mean?). That’s an impact that I see not only in my abs but also in my lower back and glutes. Easily my favorite aspect of the product so far. The one and only side effect of Shred Jym that I found was that you can’t sleep if you take it too close to bed time. I know. You think I’m pretty dumb for taking it that close to bedtime. But here’s the thing: I DIDN’T MEAN TO. LOL. Yeah you heard me right. I meant to take my ZMA caps before bed and was on the phone with my mom and wasn’t paying attention so I accidentally took two Shred Jym capsules. Thankfully it wasn’t the four or I would’ve been up all night! But needless to say you don’t want to be taking Shred Jym before bed. That’s the only Shred Jym side effect. As you can see it’s a relatively basic formula- but I can tell you it’s highly effective. Stoppani recommends taking four capsules at a time, so what you sacrifice in diversity and number of ingredients- you more than make up for because you are getting an actual effective dose of each of the ingredients. Of the list above, I think my favorites are the Synephrine (because it gives you some awesome energy in concert with the caffeine), and also the Cayenne Pepper, which I’ve always had really good fat loss results with. So as we expected, the formula is stellar. But how is the labeling? Jym supplements are lot of things- but good-looking isn’t really one of them. 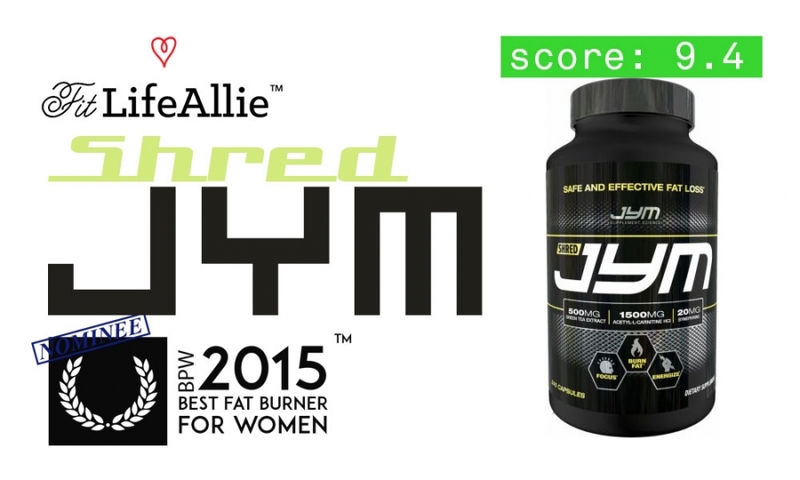 Shred Jym packaging is obviously alot like the Pre-Jym where it is a basic black color scheme with white, silver, and yellow accents. It’s a very basic, very masculine appearance, that in my opinion is a little dated looking. The hexagonal sort of pattern is just tired and overused in the supplement industry these days, and I sort of wish Jym would go to such lengths to differentiate his packaging as he does with his formulas themselves. I didn’t score this design lower because there ARE a few things RIGHT with it. His brand name is properly draped across the front of the jar so that you have no doubt who makes this fat burner. The product benefits are also clearly identified just below. From a ’textbook’ design standpoint- it’s not all that bad overall. But it’s just missing the ‘wow’ factor for me that prohibits any sort of emotional connection. Refresh the look, Jym, and you’ve got a perfect product IMO.